I posted this on social media last weekend, but I wanted the pic to live on the blog as well. If you see me out and about right now, I’ll most likely be wearing 1 of these 4 pairs of shoes. They are my GO TO’s and they pretty much cover all of the bases for me. 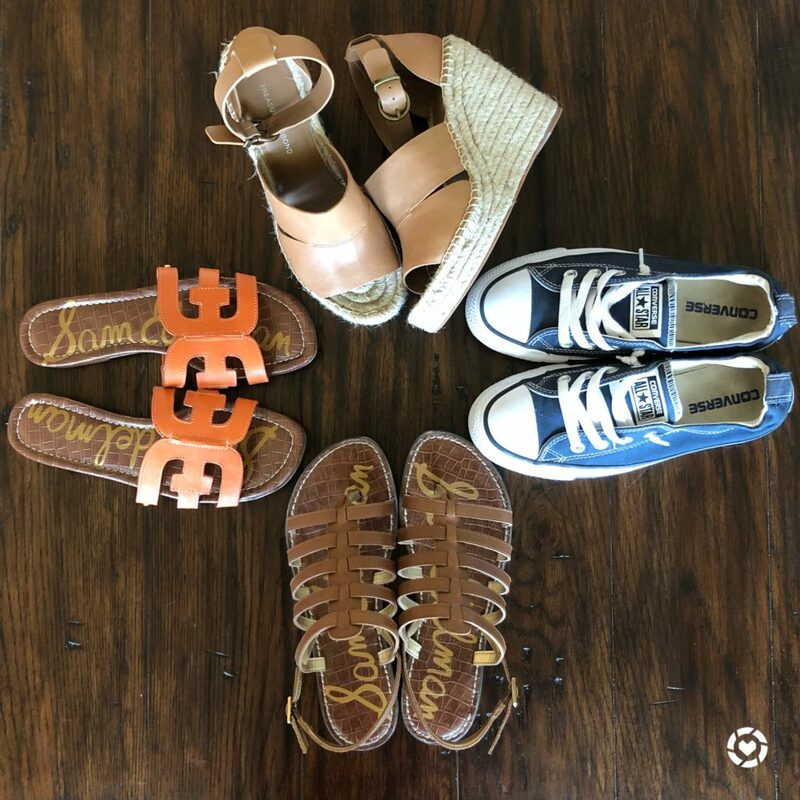 Every once in a while I’ll throw on my fav pair of flip flops or my new low profile wedges, but these are the shoe heroes in my closet. I HIGHLY RECOMMEND all of them. 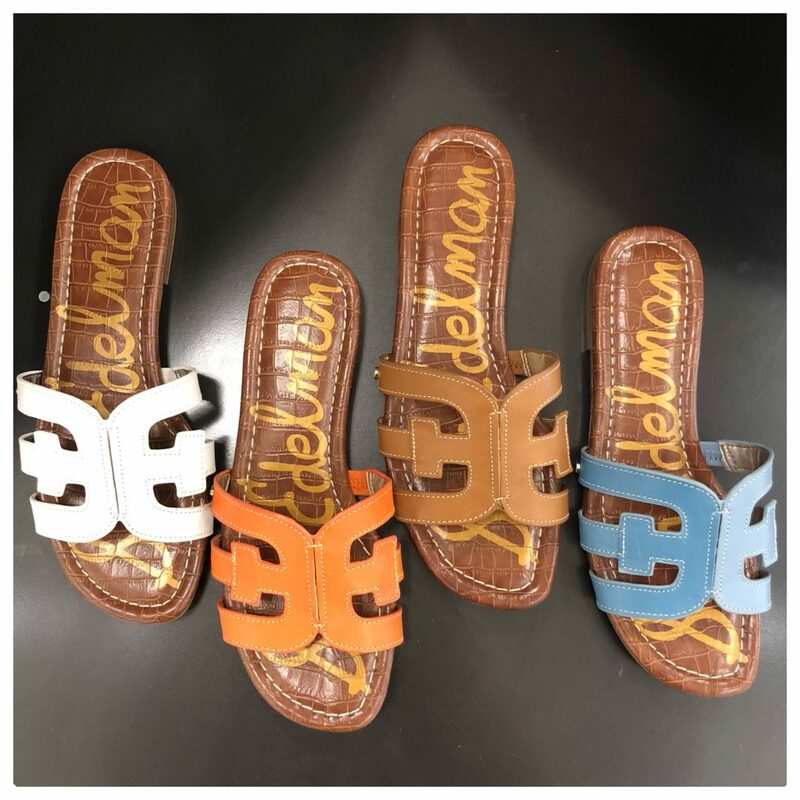 And don’t forget, if orange isn’t your thing, these slides come in lots of different colors. They also come in black, gold, silver, and even an amazing leopard print! SWOON! 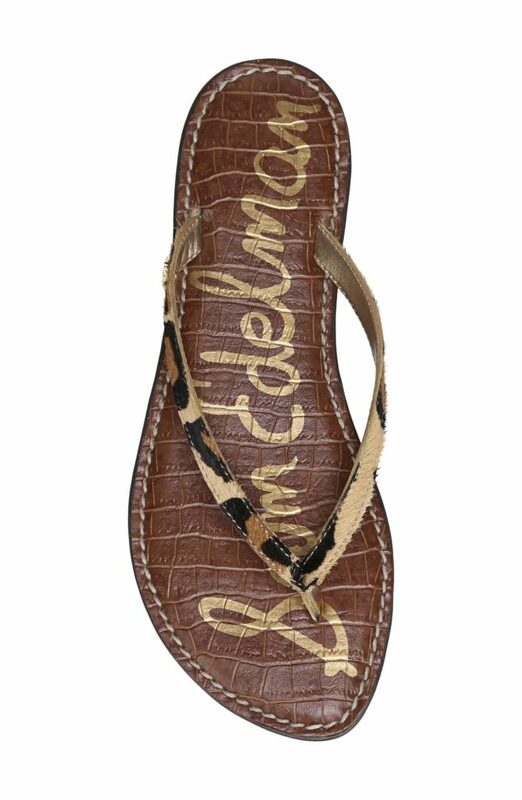 I’m not really a flip flop girl, but I do love these little leopard beauties. And they are a great price! Even better, the neutral ones are 40% OFF! GIVEAWAYS ARE ALWAYS A FAVORITE and I’m launching one today! Two of you lucky ladies are going to win an awesome prize! Did you see my SKIN CARE POST on Wednesday? 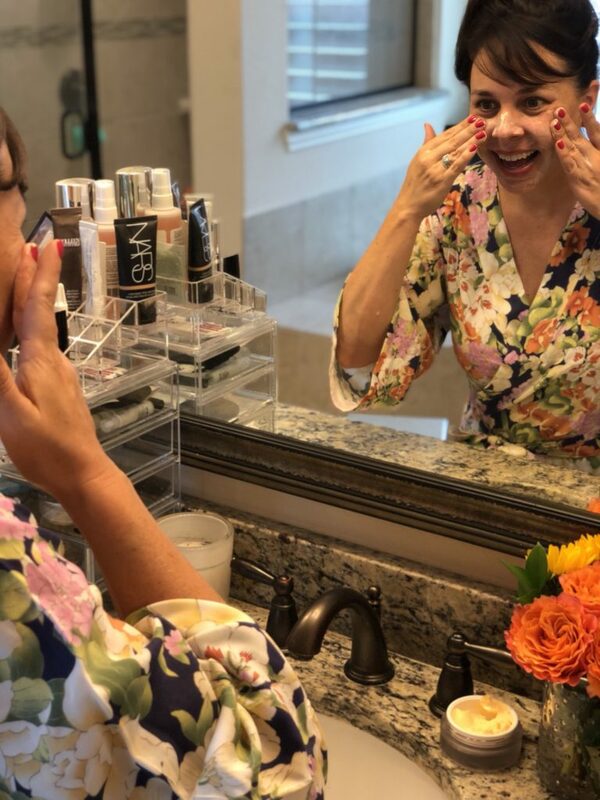 You know I love Colleen Rothschild products, and Colleen herself curated an a.m. and p.m. skin care routine for my problem areas (fine lines around eyes and dark spots), and I reviewed the products on the post. They are also having a HUGE SALE right now, so everything in the post is 25% OFF, including their new bundles that are already at a reduced price! What a deal! In addition to reading my post, you can also head over to the highlight reel on my instastories where I show and review some of my favorite products! HOW TO ENTER: If you already use and love Colleen’s products, go click over and leave a comment saying WHAT your favorite product is and WHY. If you don’t use her products yet, go leave a comment saying the 2 products you are most interested in trying. On Sunday night, two winners will be chosen (by random number generator) and the winners will each win a $200 GIFT CARD TO COLLEEN ROTHSCHILD! Click HERE to enter! I’ve yet to try a product that I don’t go on to LOVE! Each one I try pretty much instantly becomes a must have. I use the Balancing Gel Cleanser (daily & prior to any special treatment), Dual Enzyme Polish (1-2/week), Clay mask (1-2/ week usually… more if I feel a breakout coming on), Salicylic Acid Treatment (@ night w/Ext. Recovery on top to prevent over drying), Extreme Recover @ night & Sheer Renewal for day, Oil #9 as needed (winter dryness, planes, if I feel a tad tight or over dry from S. Acid application, etc.) Lip Balm, Body Lotion… love the Muslin cloths, Radiant Cleaner, & Extreme eye… I’m going to try the Mandelic Acid next I think. WHY do I use them? Because they make my skin feel like a baby’s behind… THAT is why!!!! Seriously, it’s soft as butter & my skin has changed so dramatically. Nothing has come close to working like Colleen’s products have & I’ve tried many. I have sensitive skin, still deal w/hormonal acne & many stress induced breakouts…yet am trying not to show my age! (35)- I follow the application rule of hairline to breast line & I never miss the back of my hands! If anywhere will show your age, it’s the back of the hands…maybe because people treat their face, etc & not there? Regardless of the why, I don’t want mine to be my dead giveaway, so they get it too! I literally have no idea how it’s possible, but all of the CR products just keep making my skin better & better with each new one I try… THEY. ARE. AMAZING!!! WELL GOODNESS GRACIOUS, CRYSTAL! THAT IS A GLOWING RECOMMENDATION!!!!!! I’m telling you girls, the products are amazing!!!! I know many of you were upset when the bracelet stacks I talked about last week sold out so quickly. Well, great news! They have a new shipment, and they are reinstating the code! 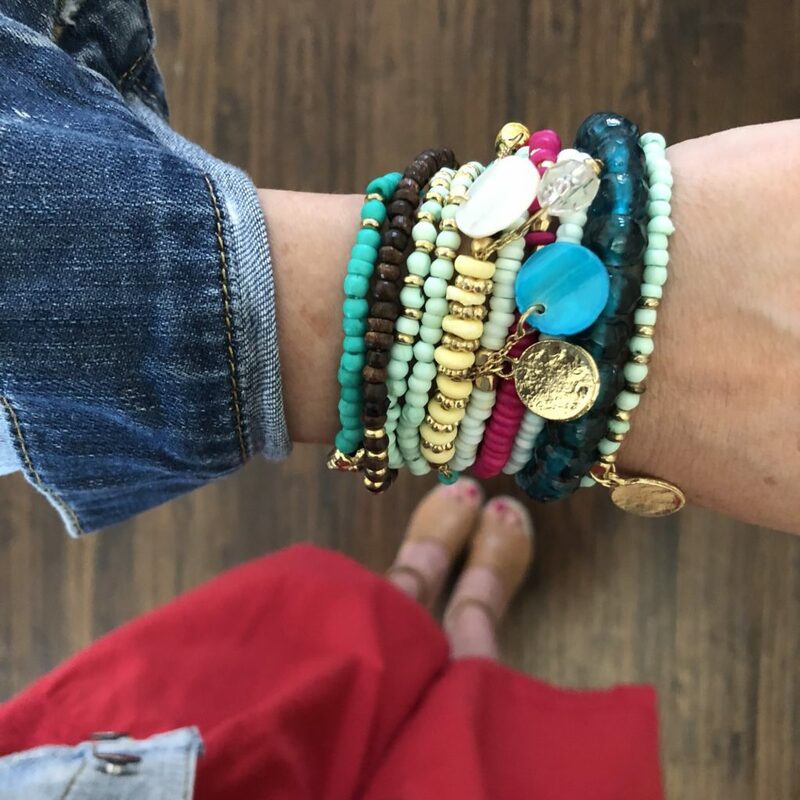 Use the code STMTset for 50% OFF this bracelet stack! That makes the stack ONLY $14! Click HERE to see the full post and outfit. Here’s a direct shot of the bracelets. If you have birthday and/or teacher gifts coming up, this set would be perfect! 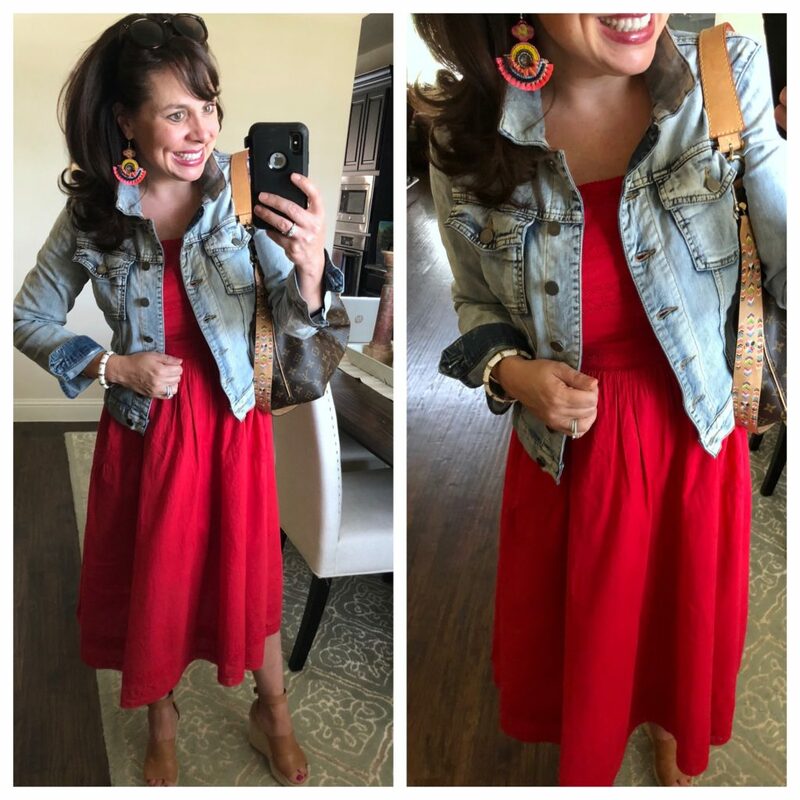 This $49 red dress has definitely become a favorite for me. 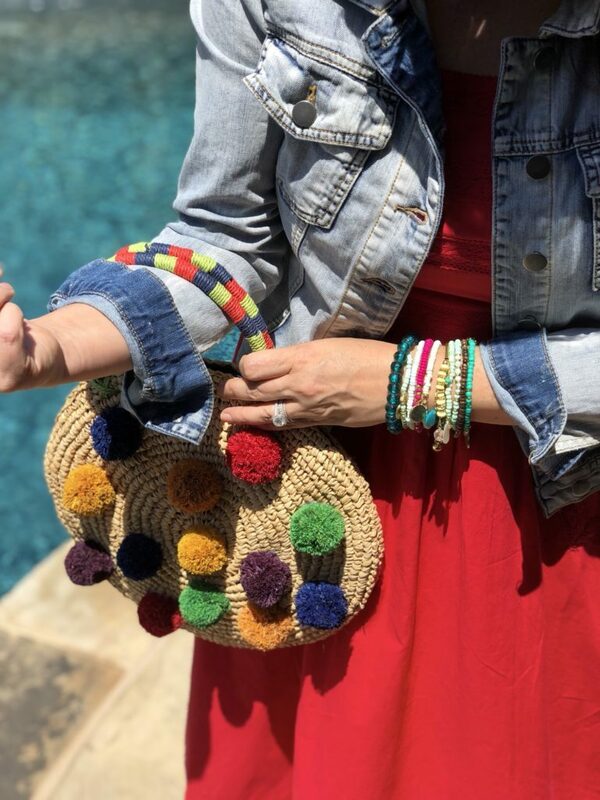 In fact, I wore it to church on Mother’s Day, I just styled it a little bit differently with different earrings and a different bag! And I had to grab a pic with the one that made me a mamma! May 11th was the 1st Annual Manda Strong Golf Tournament, and several friends volunteered the early shift to help check all the golfers in! I’m so proud of Manda’s parents for creating this foundation in her honor. 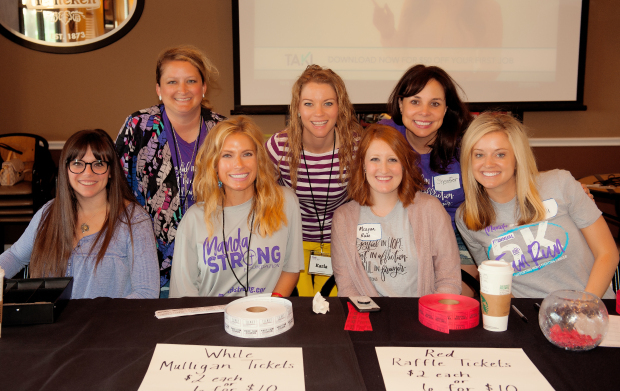 They are passionate about helping other young mom’s with cancer in Collin County, and it’s a beautiful thing to see. If you want to read more about what they are doing, you can click HERE. 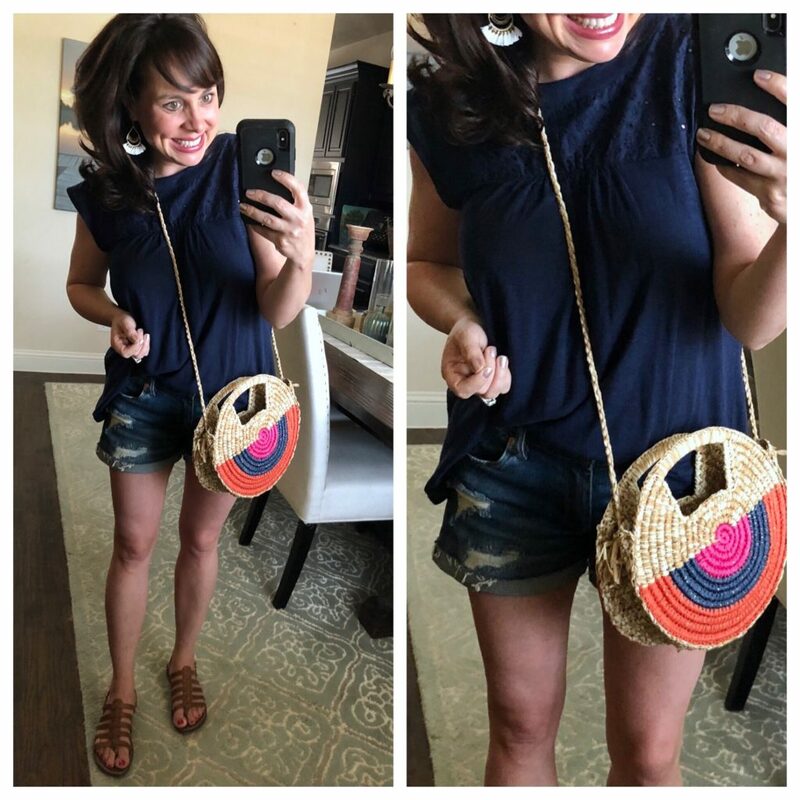 You saw this navy eyelet tee last week with khaki shorts (click HERE to see that outfit), and I love it paired here with denim too. I’m wearing a small, and it’s oversized, but I like the fit! And I love that it looks like I bought the bag while on a beach vacation! Also, you can click HERE to see other butterfly top patterns (the pink one and the chambray one are both ON SALE)! 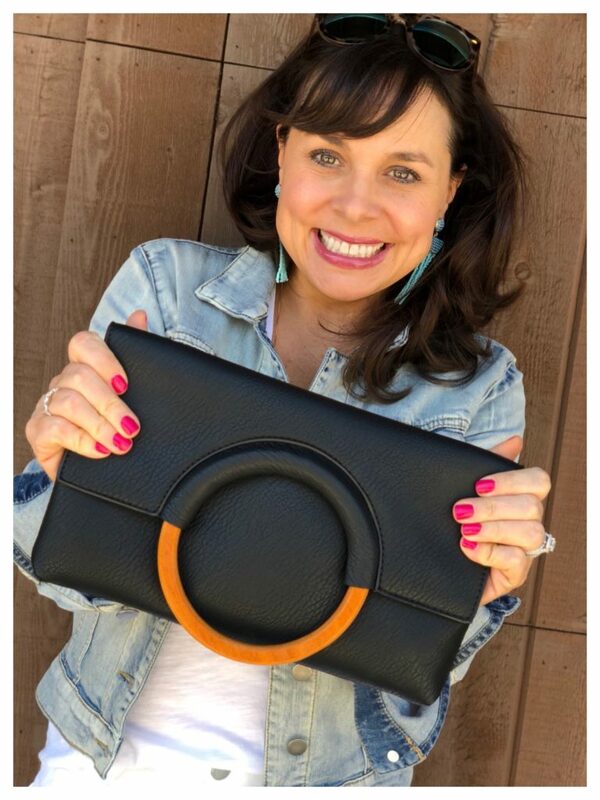 This black clutch is definitely a favorite of mine. It’s ONLY $25, and it’s so chic with the wooden ring handle. Well, NOW IT COMES IN RED AND WHITE! I felt like you needed to know. That’s all for today! 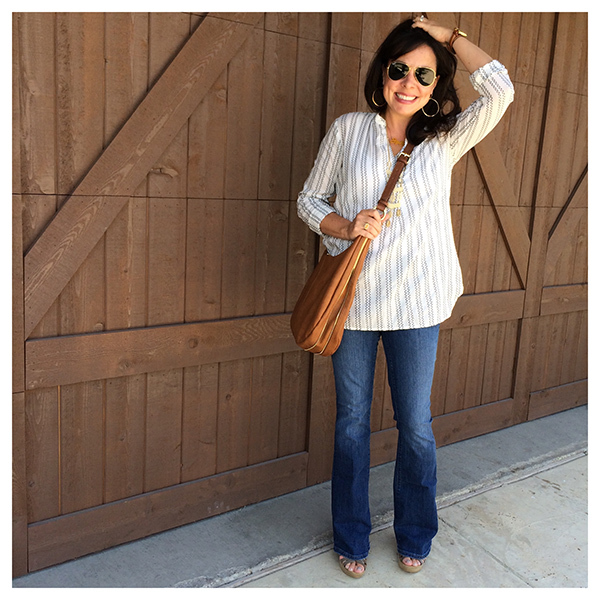 Don’t forget to check out THE SALE POST and GO ENTER THE $200 GIFT CARD GIVEAWAY! Have a wonderful weekend with your people. Saw these swimsuits on SUPER SALE this morning and had to add it to the post! Y’all know I love a one piece, and these are DARLING! I especially love the halter neck of the blue one! If you click HERE, you will find some tankini and bikini options as well! Hi Sheaffer, the Accessory Concierge code is not active. Can you help? I just used the code and scored those bracelets!! So so cute!!! Those bracelets are adorable!! And, I looooove that Butterfly top with those blush wedges! So cute! What PJs were you wearing in the Instastories you posted on Wednesday talking about Coleen Rothschild’s skincare? IT was a blush two-piece set. They looked comfy and cute! I would love to try the Radiant Cleansing Balm and Vitamin C Treatment. I read your post yesterday and am intrigued about the Colleen Rothschild products! I would like to try the cleansing balm and the clay mask. I just snatched up those bracelets! Thanks for the code! I’d love to try the radiant cleansing balm and the vitamin c serum. I would love to try the vitamin c serum and the radiant cleansing balm. The Cleansing balm is perfect! The Extreme Recovery cream is tied for first – love them both!! I would really like to try the 2 cleansers and maybe the eye cream! 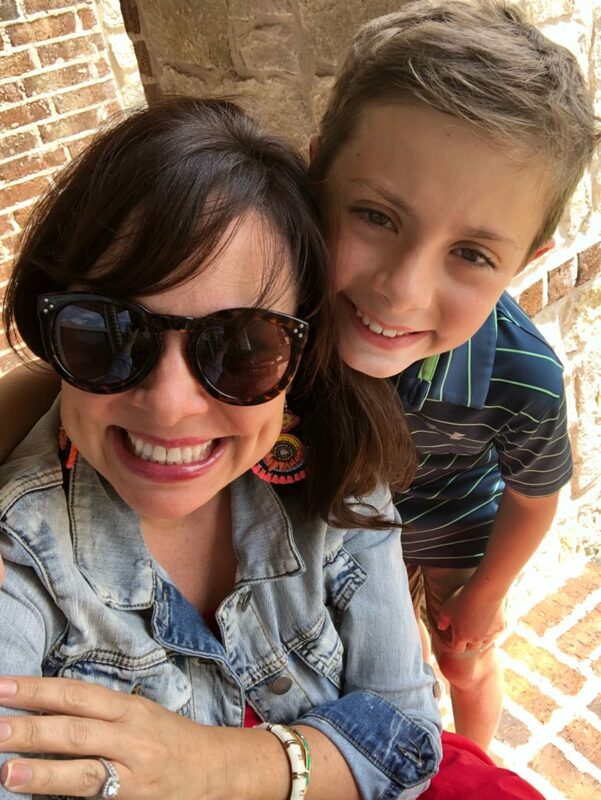 Hi Sheaffer – what sunglasses are you wearing in this post? They are different than the BP ones and I love them!! I’d love to try the extreme recovery cream and the oil! My skin is dry and would drink them right up! I’d love to get a new cleanser and eye cream! I LOVE my CR products!!!! I originally tried the discovery kit based off one of your blog post and really liked the products. However, a friend recommended a very high dollar skin care regimen from a well know name that would transform my skin and I dove all in. Worst mistake of my life (maybe not worst but it was bad!). It transformed it all right, my skin was AWFUL for months! One night I decided to use the little bit of cleansing balm I had left and I haven’t looked back. My skin is so so so much clearer now. I’m exclusively using CR. I’m a true believer in this product line! I love all the products but the cleansing balm is my favorite. That red dress is just too cute on you! I got the Accessory Concierge bracelets and I love the colors but a few of the strands are really big & stretched out seeming. 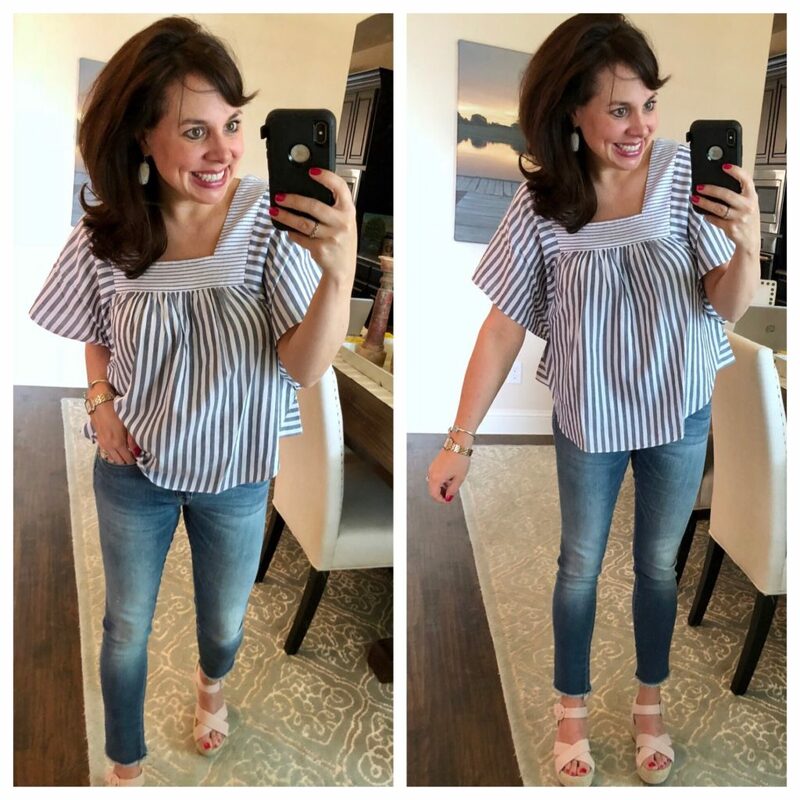 What size did you get in the Madewell striped butterfly top? Does it run big?